Add a touch of elegance with the Zippo Candle Lighter. With 7 stylish designs, the Zippo Candle Lighter creates the ambience essential for a big celebration, a romantic dinner for two or a relaxing bubble bath. Plus, it makes a great holiday, housewarming or wedding gift. 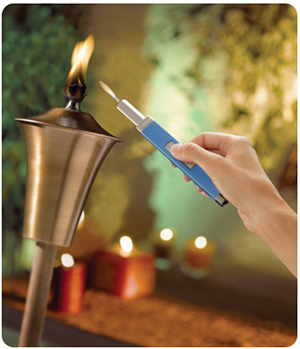 The Zippo Candle Lighter is a must-have for the fashionista with special occasions in mind. I am a long time candle lover.....so much so that my husband teases me about the large amount of candles that I've collected. There's just something about coming home and lighting one of my favorite scented candles that helps me relax. Candles are also a great "go to" gift that I love to give at the Holiday's and on other special occasions to friends and family. I've now found the perfect accessory to give with the candles that I'm gifting this Holiday Season! The Zippo Candle Lighter! Known for their amazing quality, the Zippo Candle Lighter comes in it's own adorable handled gift box (pictured below) so all you have to do is add a bow, or pop it in a bag with a nice candle and it's ready for gifting! I love the adorable Snowflake Print that I received for review, and the quality is immediately apparent. Available in several fashion prints to match every decor, the Zippo Candle Lighter would make the PERFECT Holiday Gift, Stocking Stuffer, or Hostess Gift this Holiday Season! The Perfect Candle Accessory! One Lucky Reader will receive a Zippo Candle Lighter in the Snowflake Print (pictured above)! Leave a comment~ Let me know which color / print you would love to gift or receive this Holiday Season. The comment is considered your entry. 2) Tweet ~ #WIN a ZIPPO Candle Lighter! The PERFECT Candle Accessory! @savvycouponmom http://bit.ly/gOtkk2 #GIVEAWAY #Holidays (can be repeated twice daily for additional entries~ copy paste please~cut and paste- the bit link must be posted in the tweet - I will check) (Additional 5 Entries - 5 Comments). I'd love to get the Sea Foam color! I follow via GFC and my favorite color is the sea foam candle lighter.